You are about to embark on one of the most memorable moments of your life – getting married. It’s one of the days you will look back upon for years. 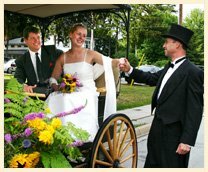 To make your wedding even more special, we would like to offer you a unique experience – to travel by the most historic and romantic mode of transportation – horse & carriage. We’re Windsong Carriage & Ranch. Your wedding is a reflection of you and your partner’s personalities and love for each other. Let us customize your experience in a way that reflects your individuality. On such a momentous day, it’s often the little details that really count. That’s why we will meet with you well ahead of your big day for a consultation. We'll discuss with you what your dreams are for your wedding day, right down to the colour and decoration schemes. 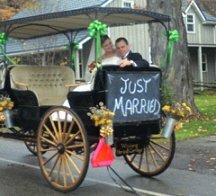 We can decorate our horse, adorn the carriage planters with flower arrangements, bring in subtle decorations, even include the traditional, old-fashioned clinkety “Just Married” tin cans. Whatever you desire for your big day, we’ll be there with you making it come true. Closer to your wedding day, we will be available to provide a “run through” of your wedding. In that way, you will know the length of time each journey will take, whether it be to the church, to the location for the photography, or to the reception. Sitting in the carriage, listening to the clip clop of horse’s hooves will be a memory you won’t forget. Our surrey carriage is hand-crafted from fine ash; our velvet seating for two to four people is plush and comfortable. Gold accents on black and our fringed surrey top create an elegant, striking statement to help you celebrate in style! These details provide creative flexibility, whatever your wedding colours, wedding theme, or special touches that will make your day unique and uniquely yours. Top hat and tails are the usual driver and footman attire, but again, we are happy to customize our service to coordinate with the rest of your wedding theme if requested. We know how important it is for your wedding day to go smoothly, and our experience, track record and satisfied customers speak for themselves. Once the planning is complete, you can sit back, relax, and smile knowing you will be riding in style with Windsong Horse & Carriage. Our horses are professionally trained to travel on a city street or rural road - and you'll be comfortable while enjoying one of the world's most romantic modes of transportation - the old-fashioned horse and carriage. Once again, congratulations! We look forward to being part of your special day.